This bundle is suitable for owner operators or rental houses that require three parfocal zoom lenses with PL mounts that provide full frame coverage over a focal length range of 15 to 200mm. Included are a ZEISS 15 to 30mm CZ.2 zoom, 28 to 80mm CZ.2 zoom, and a ZEISS 70 to 200mm CZ.2 zoom lens. The zoom ranges of the lenses overlap for more flexibility when intercutting. 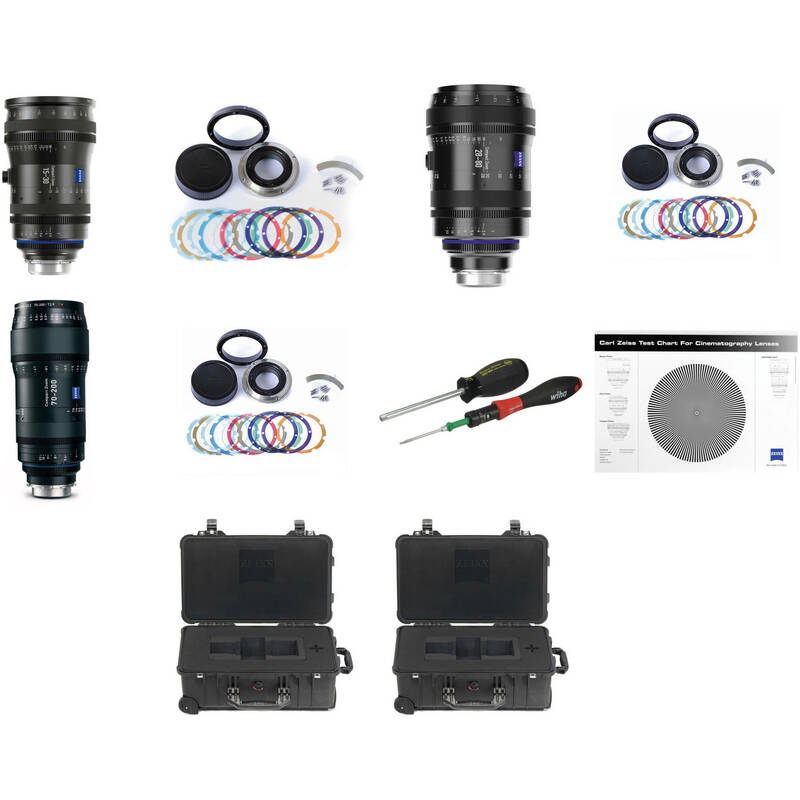 The bundle also includes three replacement Canon EF mounts with shims, so you can swap mounts if you want and a Siemens test chart that enables you to confirm that your lenses are collimated properly. The three included transport cases and foam inserts protect your lenses during transport and storage. The ZEISS 2075-923 Interchangeable Mount Set for ZEISS 15 to 30mm Compact Zoom is designed to convert the original mount of the Compact Zoom CZ.2 15-30/T2.9 zoom lens to a Canon EF Mount. The Interchangeable Mount consists of a mount, lens caps, adaption ring with support bracket, screws, and a set of shims. Includes a mount, lens caps, adaption ring with support bracket, screws, and a set of shims. The ZEISS 28-80mm T2.9 Compact Zoom CZ.2 Lens with PL Mount is a standard zoom lens that is optimized for motion picture production. The lens offers full-frame (36 x 24 mm) coverage and exhibits no focus shift over the zoom range. The cine-style housing features calibrated focus scales and industry standard gearing for focus, iris and zoom. At 7.72" long and with a weight of 5.5 lb, the 28-80mm is relatively compact and lightweight, which makes it ideal for handheld and Steadicam applications. The lens features a built-in lens support post, with 3/8" threading for use with available lens supports. The ZEISS Interchangeable Mount Set EF allows users to convert their CZ.2 70-200mm T2.9 lens to a EF mount. The set includes an EF mount ring, an adaption ring with support bracket, Torx screws, eleven color coded shims and a rear lens cap. As the flange focal distance varies from camera type to camera type, it is sometimes necessary to make adjustments when changing the lens mount or camera model. In order to perform this adjustment, shims in eleven different thicknesses are provided. The ZEISS Siemens Star Test Chart is a professional lens chart that has been used for decades to set the back focus on lenses used on individual cameras. It is especially useful when adjusting a ZEISS CP.2 cine lens for use on a DSLR camera after the lens mount has been converted from PL to another type (such as EF), or vice versa. Box Dimensions (LxWxH) 15.3 x 12.7 x 12.0"
Box Dimensions (LxWxH) 4.6 x 4.6 x 4.6"
Box Dimensions (LxWxH) 14.488 x 12.677 x 12.205"
Box Dimensions (LxWxH) 4.6 x 4.5 x 4.5"
Box Dimensions (LxWxH) 4.7 x 4.7 x 4.6"
Box Dimensions (LxWxH) 7.4 x 1.4 x 1.3"
Box Dimensions (LxWxH) 17.8 x 12.5 x 0.3"